These minute meditations for every day of the year contain a Scripture reading, a reflection, and a prayer. Father Winkler offers us an opportunity to develop a closer relationship with the Holy Spirit and apply the fruits of our meditation to our everyday lives. A positive resource for daily devotions. Daily Meditations with the Holy Spirit is a useful book for starting your day out with God, especially if you wish to be in tune with how the Holy Spirit is leading and guiding you for the day. It will engage your heart as well as your mind and will help you focus on The Kingdom of God as opposed to the world we live in. It definitely is an aid toward "thinking on these things". I believe you will be blessed in owning and using it. Wonderful Daily Prayers. I loved it so much I order two additional copies for my brothers! Excellent book. Sometimes in our hectic daily lives we forget about the Holy Spirit. This book is a perfect reminder. Very meaningful short paragraphs to read and meditate on. Each day's message is inspirational. Excellent short passages; quick read; nice meditations and prayers. Great purchase. Nicely bound. My mom was so touched when my sister & I gave her the book & CD. She loves them both. These daily meditations are short and thought provoking, giving me a spiritual goal for each day. Excellent. Really gives me something to think about during the day. I would suggest it for any one. Love, love love this addition to my daily prayers. Has inspirational entries that are helping me understanf and really appreciate the Holy Spirit. 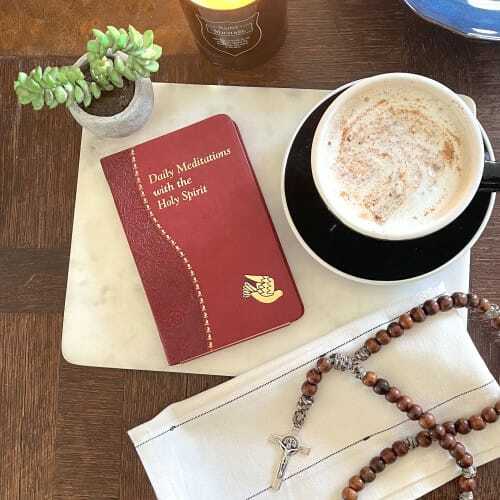 A compact book which takes you to the Holy Spirit with thoughts and a prayer to help you through the day; only takes a few minutes to get you on your way in the right direction. I enjoy reading devotions to start my day. So far this is a great meditation with God and the holy spirit. I would recommend this book to others. I purchased this for myself and find it a wonderful inspiration every day. The entries are brief---and a great way to start out the day. Liked it so much, have purchased as a confirmation gift for my niece. Exactly what I was looking for. A great way to start my day is reading the daily meditation. I find the meditation calming and infuses me with self confidence. During the day, I find myself reading a passage or two when I need a pick me up. I really would recommend this to everyone that needs a bit of encouragement. This is a beautifully bound volume that is a perfect size. It fits into all my purses. The daily meditations are soul feeding. I highly recommend it to all who may be looking for a short concise daily worship source. Love this little book. So glad I purchased it. My husband & I read this meditation together at the breakfast table - then, we have a short discussion on our personal interpretation of the daily reading. We enjoy sharing these inspirational reading each morning & begin our day thinking in a positive manner. This Daily Holy Spirit meditation is awesome, before I bought this book I was always thirsting to feed my spirit, now my spirit is being fed daily with God's Word and prayer! I read this book every morning for a little something to think about during the day and keep me on the right path. I find this very helpful with daily meditations and for use when planning charismatic prayer group meetings.